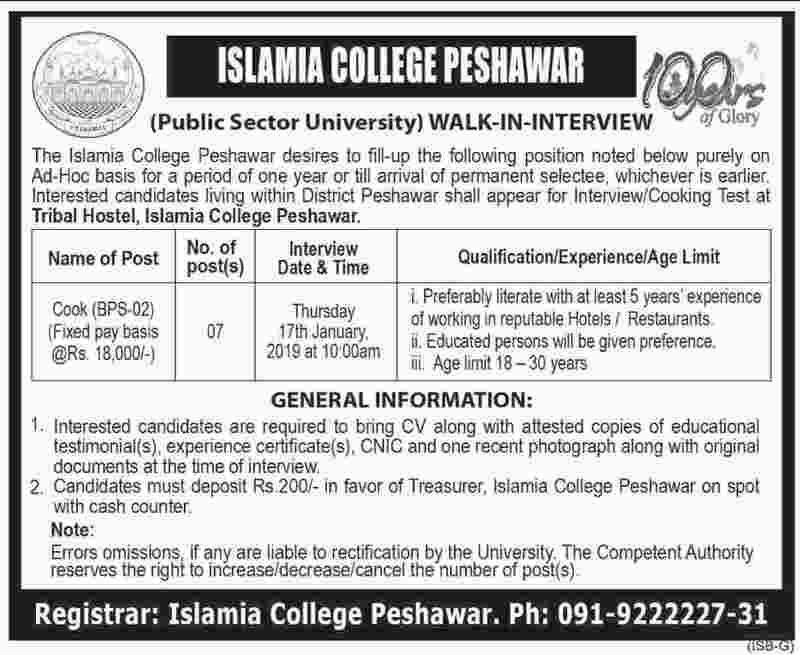 Below are the complete details of the Cook jobs in Islamia College in Peshawar. Skills Required for Job: Listening, Speaking and writing & Analytical and Problem solving skill. Cooking is a science, so a chef needs to be precise. A good chef is also a good businessman. Chefs need to know how to keep the kitchen sanitary. Culinary Expertise. Qualification: Islamia College Jobs for Cook Qualification:- Candidates should be at least Literate Degree Holders & Minimum Experience:-Preferably have 05 years of working experience in the field interested candidates fulfilling the above criteria can apply at following address incomplete documents/late application after due date will not be acceptable. 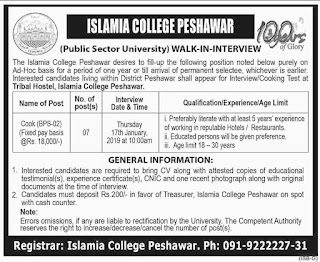 Cook jobs in Islamia College Peshawar, in Pakistan published on Paperpk.com from newspaper on January 12,2019. Job seekers who are already working as Chef , Cook , Professional Chef , Cook Helper , Head Chef , Executive Chef , can also apply for post of Cook.